Notes: March 1998 Tim Hills: A tall yew with a fine internal stem filling part of its hollow. It grows ESE of the church. 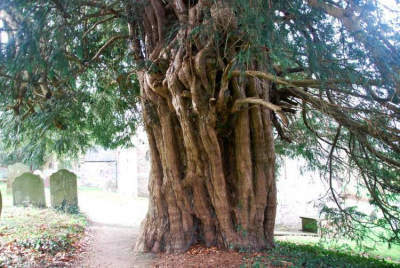 Latest information: 2017 Peter Norton: The large female yew grows close to the southeast corner of the church. It has a large flared root which hindered measurement below the nails that somebody has hammered into the tree at a height of 4' 6''. I used these nails to record a girth of 22' 4''.